I have repeatedly said one of the best things of this project is that my eldest daughter and I are spending time together working on it. Unfortunately the extreme cold weather we are having has done a number on her health causing pain in her chest and overall discomfort. As such, she is unable to work in our shop for very long which has created a major damper on that time. 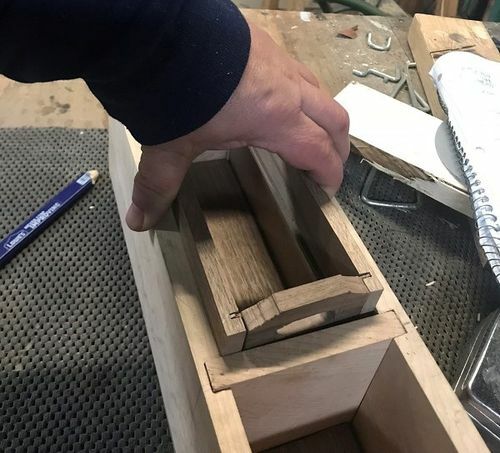 So today, I took her out to Wright Patterson Air Force Base’s wood shop so we could build her portion of the project – the lower free standing drawers. With my assistance, she was able to joint, plane, and cut the two boxes leaving them ready for the plywood bottoms that we’ll cut on Sunday. Great start and take care there’s way to much sickness going around these day’s. Looks like an interesting project and it’s really great that you are doing a project with your daughter. A great way to bond.